White is always a wonderful colour to use in flower arrangements. It is probably mostly associated with summer. It is surprising how many white flowers you can find at this time of year. 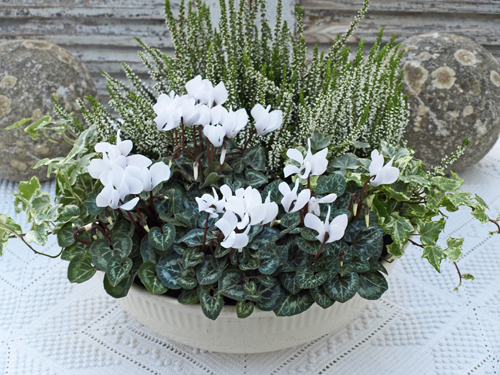 In a very large white, vintage bowl I planted white cyclamen, white heather and a green and white variegated ivy. It is not a practical long term solution as the bowl has no drainage holes. A short term pure pleasure for the table! I will later plant them in an outdoor container and the arrangement will, if it stays mild, last for a few months in the garden. BEAUTIFUL!!!!!!! Love your white on white arrangement (I am big on white on white, pink on pink etc...) - stylish and elegant!!!! And the vintage bowl is a dream too!!!!! I think white flowers work all year round - I especially love them in the winter! I am sure you will get A LOT of pleasure out of it!!! Vit cyclamia är nog en av mina absoluta favorit blommor just nu. Har en kopparbunke full ute i uterummet just nu.Vardags lyx som gör en lycklig! Vackra och inspirerande foton som vanligt! White cyclamens give me winter feelings...I like that so much...but I hope it will take a few months (or a long time) before we have snow :-)!! These are so nice! I especially like the cyclamen. 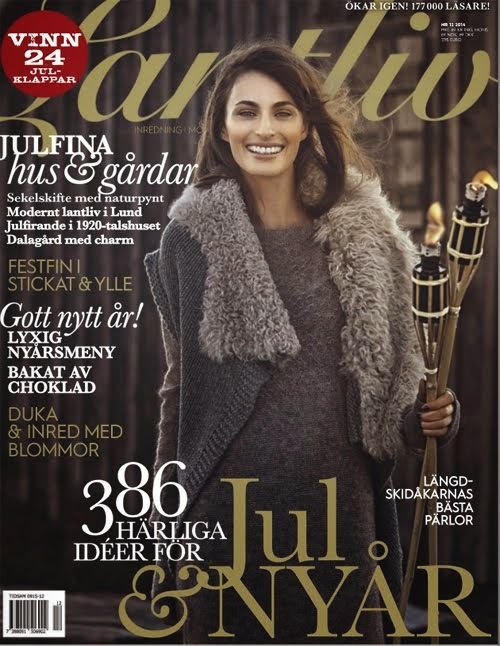 Kära Ingrid, så vackert du pyntat. Du får mig att le - jag har precis samma arrangemang i en kruka. Jag lägger ett tjockt lager leca-kulor i botten - det brukar fungera. 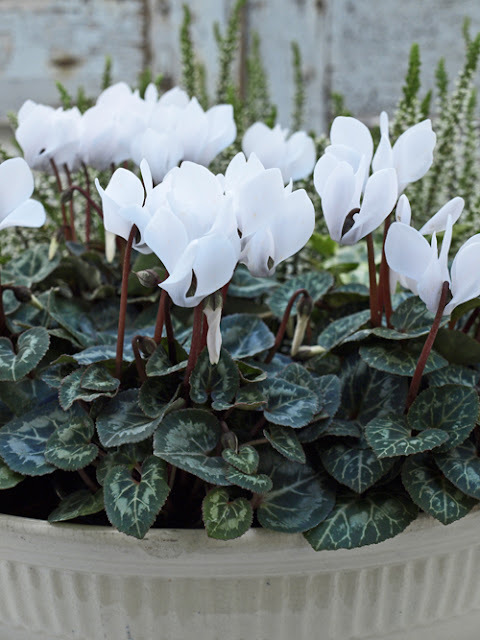 Dear Ingrid, I have white Cyclamen throughout the house in autumn and winter. I love their freshness and their staying power. Your arrangement looks delightful, teaming the Cyclamen with Heather. I am not over fond of Heathers but the white flowered forms are rather elegant. I love all your arrangements....all, but this is my favourite so far....until the next one!!! Gorgeous! You create the most beautiful arrangements, Ingrid! I adore white ciclamens!! I have one on my desk in the offce so that I can relax by starring at such a lovely plant!!!!! Dearest ingrid, this is such a beautiful arrangement! Your white arrangement is truely elegant. :) Have a lovely merry happy week and love to you!